I know what you're thinking. Is that spoon in there because she ate it from the bowl? Why yes it is. It was delicious. 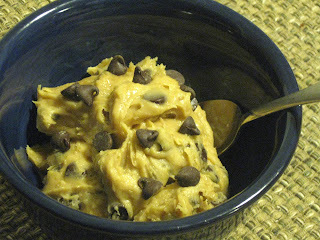 You know how regular chocolate chip cookie dough is grainy from the sugar? This isn't. 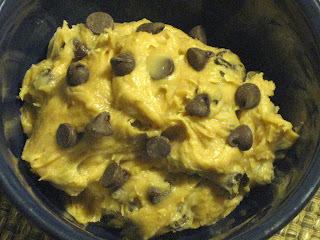 It's completely smooth with the exception of the chocolate chips of course. It has a light peanut butter undertone and a hint of vanilla. Of course there's no eggs in it so you could eat the whole bowl with no worries, but it would probably be better to share :). 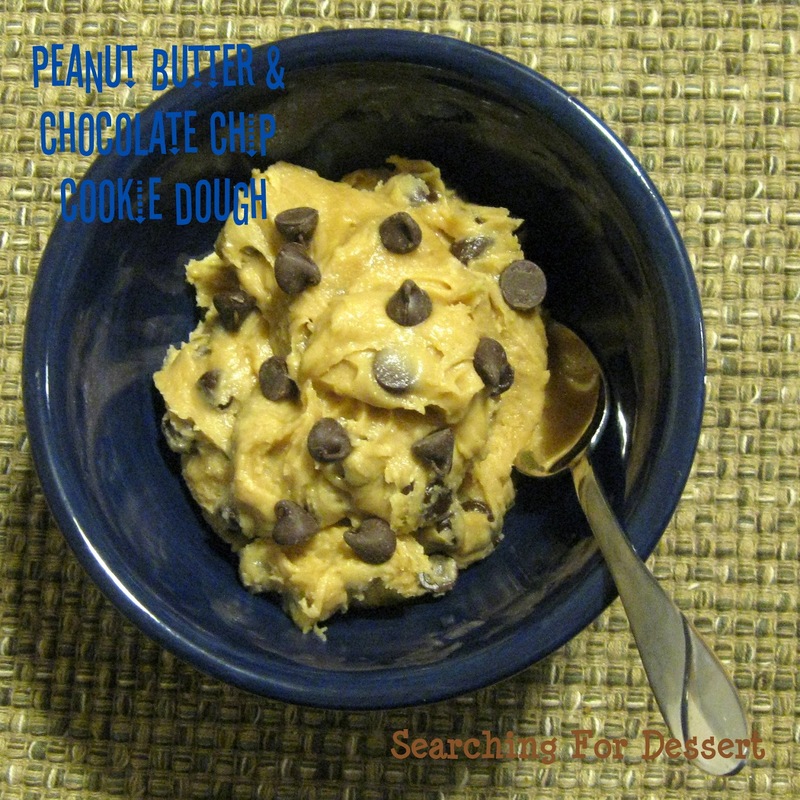 When this dough is first made it's very smooth but seems a little thinner than traditional cookie dough. Not to worry though, about an hour int he refrigerator and it becomes more firm although it takes a little longer than that to have the stiff cookie dough texture. I think this would be amazing if you used mini chocolate chips and dolloped teaspoonfuls of dough onto a sheet pan and froze it until it was stiff then put it on vanilla ice cream. I might try freezing it then baking it in a cake, yum! I'll start working on that. I tend to work out some of my ideas while I'm telling you all the fun things you could do with the recipes. I will definitely be making this again and I may or may not have eaten the whole bowl by myself over a 24 hour period (or less) because it was so good and I kept munching on it. This of course is why I try to make smaller portions of desserts (because I tend to eat them all). Happy cookie dough eating! 1. Mix all ingredients together except chocolate chips on low speed until blended. 2. On medium speed mix about 30 seconds until smooth. 3. Stir in chocolate chips. I recommend putting the dough in the refrigerator for at least an hour for firm up slightly.